Serve these healthy falafels with yogurt, tzatziki, tahini sauce, feta cheese, tomatoes, cucumber, onions, shredded lettuce, sprouts or roasted peppers and eggplant. Click here for instructions on cooking dried garbanzo beans. Place all ingredients (except oil) in food processor pulse until mixture is a bit smoother than couscous. Stop to pulsing to scrap sides for a consistent texture. Cover the bowl and refrigerate falafel mixture at least 2 hours. You can mix a batch and keep it in a container with a tight fitting top and use it to make fresh falafels for the week. Pour 1/2 teaspoon olive oil in each section of a 12 muffiin pan. Spoon 2 tablespoons of mix into clean hands and shape into balls. Serve with pita, flat bread or warmed flour tortillas. 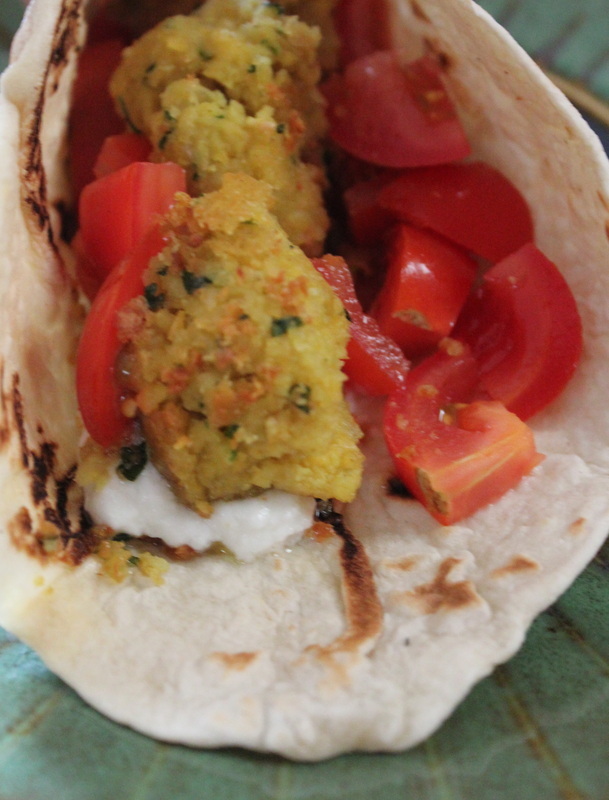 Typically falafels are fried, not baked. You can fry them in oil for about 2-3 minutes per side.